Central Presbyterian Church was constructed in 1885 as the congregation's second church. Central Presbyterian was organized in 1858 with 39 members from Atlanta's original Presbyterian congregation. The church was designed in the English Gothic style and has rough cut limestone on the main facade and plain brick on the others. It has a high bell tower with a pyramidal roof and truncated tower. An entrance foyer at street level has stairs leading to the sanctuary that is one level above the street. It retains its original stained glass windows, stairs, wainscoting, plaster walls, and altar area. Socially committed to the community, the church established outreach programs to all areas of the city by launching a dozen mission Sunday Schools and five new churches by 1890. In 1907, it founded the Atlanta Union Mission to provide shelter and meals to the homeless. A public health clinic for babies provided free medical service to children of needy families beginning in 1922. In 1925, a three-story adjacent building, called the Campbell-Eagan Building was constructed, with brick walls and a slate roof . The first and second floors housed classrooms while the third level contained a gymnasium with a balcony and a stage. The church continues to support the community through its daycare center and Family Clinic. 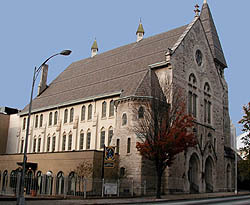 Central Presbyterian Church is located at 201 Washington St., in Atlanta. It is open to the public during regular church services; call 404-659-0274 or visit the church's website.